As suspected, the opportunity to update our beloved blog have been few and far between. We are sending this from Jayapura, our last stop in Indonesian Papua before we head into PNG for the last two months of our trip. Jayapura looks like an interesting sort of town and we plan to spend a week here filling the boat with food to last us the next couple of months – plus plenty of items for trading in exchange for shellfish and bananas. Thankfully, we have been having a far better time over the past few weeks than when we wrote from Bitung and Sorong. Papua remains somewhat of a mystery to me, however – it feels nothing like Indonesia and yet is part of that country; its people as we have come East are uniquely Papuan and the link to the administering country seem weak. There are periods of huge civil unrest and instability and the 'free Papua' movement has an large international voice. In the islands where we have been spending our time over the last couple of weeks, however, the people are gentle and friendly and seem to continue their simple island lives without much in the way of external influence. But then what do I know? Here in Jayapura, it feels like Indonesia again, with many people having been encouraged to settle here from Sulawesi and Java. The people are SO friendly - every walk down the street requires several stops to chat and many handshakes - plus deft sidesteps to avoid the projectile spitting of betel nut. So, when we last wrote we had arrived in Manokwari, where we spent 24 hours and had another sleepless night on anchor watch due to feeling uneasy about the attention the boats were drawing. The Lonely Planet described Manokwari as 'mellow' and described a few restaurants that suggested the presence of tourists and the possibility of a trip to shore. In the event, the town was the usual dusty mess of small shops and motorbikes and the locals stared at us like we had a few too many heads. The prolific use of betel nut may have had something to do with this...The Harbourmaster was only willing to let us stay overnight as Manokwari had not been listed on our cruising permit, and only allowed us to stay at all because the gear box on our port engine had finally given up the ghost earlier that afternoon. Oh the joys of boating. 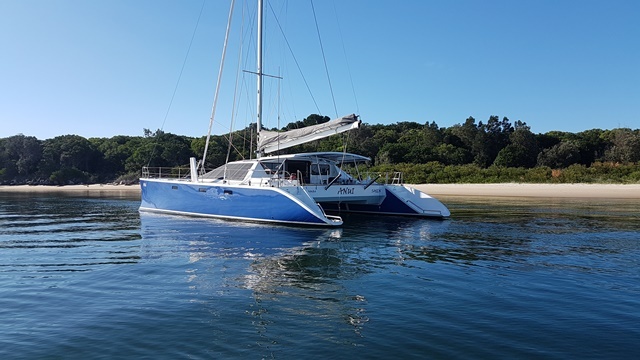 We were then running on one engine, therefore, meaning that we would be able to cover less miles until we managed to find somewhere to beach the boat and have access to the sail drive. We crossed the top of the Cenderawasih Bay to the island of Mios Num where we were glad to find an anchorage just off a palm-fringed beach. There were reefs to snorkel and even a perfect 4-5' right hand reef break, which Scott had a ball on and named 'Scott's Break', after we all agreed that it was unlikely that it had ever been surfed before. The locals came past in their canoes on their way between villages but nobody bothered us – we stayed a few days. Our friend on Unicorn went to have a look at the next bay and reported back that it was the perfect spot to beach the boat. An inspection by dinghy confirmed this and so last week we were able to go up at dawn on the high tide. Scott, Seth and I worked to replace the dog clutch in the gear box, install the new propeller and clean the hulls and by the time the tide came back in we were tired but all the work was done. A few local guys came by with their machetes to have a look and nod sagely at Scott working under the boat. We gave them a spark plug and a litre of engine oil and they were off into the bush. Later that night they came back to the boat to bring some cooked fish and 'bread' to trade. They watched whilst we tried the food. I hope I am not required to eat Papuan bread again. It was a mixture of dubious raw fish and a bready mixture made from palms. You can imagine. We were also offered their local moonshine made from nipah palms, but this we refused, having been warned that it smelt like paint stripper. From Mios Num we went across the North of Pulau Sonorawa (also known as Yapen) and then up to the Padaido Islands South of Biak. They were heavenly and very hard to leave. We divided a week between the islands of Nusi and Dawi. In Dawi, we anchored in a lagoon surrounded by reef, next to the beautiful island. The small fishing village on the point of the island was deserted when we arrived but over the days its residents returned from the larger islands to the North and began their routine of fishing from their hand-dug canoes and sleeping the afternoons in their hammocks under the trees. The island is mainly inhabited by women and children; we didn't discover where the men were, but assumed them to be working elsewhere. As they got used to us, the women would come by for a chat but generally waved from the shore. We made sure to use the beach to the other end of the island, so as to not to invade their peace. Over the last couple of days, we were visited by a couple of the older women with their grandchildren, to trade shells with us in exchange for kids' clothes and some food and to ask for paracetamol for their headaches and back ache. Must remember to buy more in Jayapura. One little boy, Martin, who had been out with his grandmother, came back to the boat for the afternoon after watching the boys snorkelling and sat quietly on the back steps until we invited him on board. Seth replaced the rope on his very leaky canoe and he spent a few hours drawing with Seth and Finn and eating his way through whatever was put in front of him – anything that had sugar in it, anyway! He was a lovely little guy and when the sun had gone down he smiled and waved and was gone, stopping several times across the bay to bail his leaky canoe. After this week we will be largely blogless for the next two months. I'll get my sister to put a brief message on to let you know where we are and those of you who follow the tracker can see where we are from that. We plan to head out to the Hermit Islands and Kavieng in PNG, which sound heavenly and mean we can avoid the mainland completely. Then to the Louisiades and then home – more thoughts on that later. In the meantime, there are more toilet rolls to buy and the joys of eating a plate of nasi goreng that I haven't had to cook!Tonight we were the guests of a local family for dinner - fanastic food eaten on mats on the floor and such fine hospitality. Interesting contrast to places further north. Glad you're all keeping safe. Just reading what you're seeing makes us thankful for what we have - at the same time as still being envious of your adventures lol. Impressed with Scott's ability to keep everything moving - whilst keeping one eye on the machete I'm sure! !